WHO NEEDS A BIG HOUSE? Big houses mean big headaches, if you ask Chad Johnson. Maintenance-free living eliminates worries for today – and tomorrow. MEET CHAD AND JEAN JOHNSON, WHO SAY THEY’RE HAPPIER WITH THEIR CURRENT LIFESTYLE BECAUSE OF THE HELP. After raising their family in Burbank, California, where Chad owned an auto repair store, the Johnsons retired to the golfing life in Rancho Mirage. 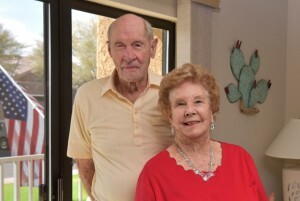 That lifestyle worked beautifully for them for many of the 26 years that they lived at Sunrise Country Club. However, as birthdays rolled around, they enjoyed it less and less. If you ask Jean, it was just in the nick of time that they relocated to The Fountains. She wouldn’t have the energy today. They relish not worrying about home and yard work and Jean especially loves that she never has to cook again. Their kids and grandkids visit frequently and they don’t regret their move for a minute. 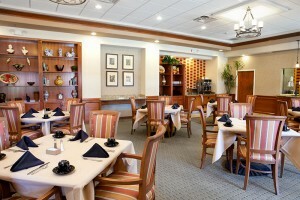 Meet Chad and Jean in person over a cup of gourmet coffee or a drink in our dining room. Just call 1-760-600-5904 to set up a time. Bring your questions and get honest answers straight from the source.